Not every online slot machine is a five reel and twenty payline, state of the art creation; sometimes it’s good to go back to the source and take advantage of some of the classic, three reel slots available at most online casinos. 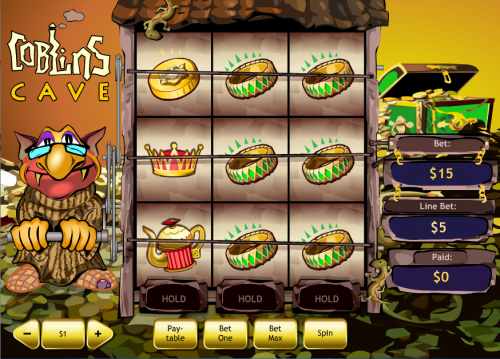 Goblins Cave is a prime example of a simple concept allied with some nice graphics to produce a game which should be entertaining for everyone, whether you prefer the classic, one-armed-bandit style Las Vegas slot or a something more complex. That complexity can sometimes wear even the most hardened tech-fancier down and this slot is the antidote. 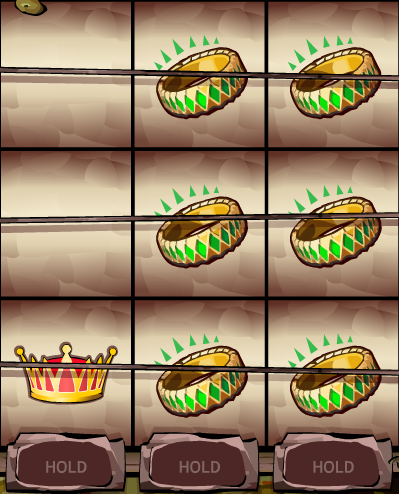 Goblins Cave is a three reel slot with some funky additions which we shall expand on shortly; when you first load up the game you’ll see the reels in the centre of the screen housed in a small hut on which perches a lizard, but you’ll also notice there are two blank reels above. On the left of the reels is the goblin himself who turns the crank which activates the reels every time you press the ‘Spin’ button; to the right of the reels are the boxed containing your betting information – your bet per line, your total bet and any winnings. Everything is set against the backdrop of piles of goblin coins. The symbols are a mix of golden objects such as rings, coffee pots and crowns while a red gem is the wild symbol. Betting is extremely simple, just use the plus and minus signs in the bottom left hand corner to raise or lower your stake and away you go. You are always betting on three paylines so be aware that the stake is then multiplied by three. Now press the ‘Spin’ button to start the game and the bottom reel will spin to reveal three symbols; now you have the chance to hold any or all of the reels. Spin again and all three paylines will contain symbols with any reels you held containing the same one. The next spin will revert once more to just the bottom payline. It’s a simple slot if you like a simple game but the three reels and the ‘hold’ feature add a little extra to the mix.